Candidate mapping is an executive search best practice. You identify the heads of teams out of which you want to recruit. You then identify their direct superiors. It is a powerful way to bulletproof talent acquisition. When you map specific teams at target companies, it makes it easy to spot holes in your research. When you see that you have only 2 executives reporting to the head of a team, chances are there are another 3 or more executives out there waiting to be discovered. In other words, candidate mapping and building org charts of target companies help you raise your game. It helps you make sure you that you don’t miss talent that should be included on your list of potential candidates to recruit. However, despite that benefit, executive recruiting and candidate sourcing teams regularly skip the org charting step and, as a result, regularly fail to discover A-players. That recruiting short cut results in searches that drag on for far too long. In fact, failing to map candidates can cause searches to fail. Without candidate mapping, you miss candidates who would be perfect for the job, if only those you knew that they were there. How is it that candidate mapping or org charting might surface talent that might otherwise lay fallow were a sourcing team to rely exclusively on LinkedIn instead ? LinkedIn data is only as good as the users who enter the information. It frequently lacks specificity and, in many cases, the information is out of date. That means there are lots of people whose profiles show they’re currently working at a company, when they have moved on and actually are working at one of your target companies. That lapse is a hole in your sourcing research. In addition, there is still a sizable chuck of people who have not gone social due to concerns about privacy, data security, identity theft, or because they don’t want to appear as though they are looking for a job. The more powerful the executive, often more elusive they become on social networks. For instance, I’ve noticed that powerful Hollywood executives either avoid social networks entirely — cultivating an elite image by making themselves “unlisted” online — or they prefer Facebook to LinkedIn for networking, because the networking is easier to do “behind closed doors” with select Facebook friends, much like a back room a at hot nightclub that admits only VIPs. When does it make sense to map talent? It makes sense to map target companies out of which your regularly recruit, and to refresh that candidate sourcing data on a regular basis. Candidate mapping makes sense for senior-level executive searches whenever the aim is to hire the best talent the market has to offer. It also makes sense whenever you have an important search that has hit the wall. Intellerati is regularly called on to rescue ailing search efforts for openings that prior search firms and recruiting teams have struggled without success to fill. Every time we’ve been brought in to help, the client makes it a point to advise us not to look for candidates that live within recruiting distance because they’ve “already seen everybody” over the course of the 9 months or year that they’ve been looking. However, in every instance, we’ve come back with a robust list of prospective local talent. While I’d like to say that identify those missed candidates was hard — we are capable of doing real investigative research — in most cases the candidates were pretty easy to find. However, those individuals were overlooked because prior efforts had not gone to the trouble of mapping relevant teams at all of the target companies. The next time you have a critical search or a multiple openings that send you back the the same target companies over and over again, experiment with mapping candidates and building out org charts of their teams. It is the only way to identify and plug holes in your research as you discover great talent. Executive maps turn candidate chaos and they lay down serious due diligence. 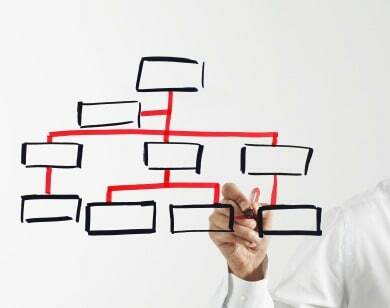 The org charts tell you where the talent is and where it is not. It documents where you’ve been and where you’ve still have left to go. It is the only way to answer the question , “Do we have everyone?” For executive search and mission-critical openings, candidate mapping offer a road map to never getting lost. For everything you want to know about how to obtain org charts on other companies, check out The Definitive Guide to Org Charts.